Manufactured by the J. C. Deagan Co., 1934 in 1934, Clair Omar Musser began to organize his 100-piece marimbaAn instrument that consists of a large frame and a set of tuned wooden bars which are struck wi... ensemble known as the International Marimba Symphony Orchestra (IMSO). Musser coordinated all activities of the ensemble, including auditioning the players, arranging the music, and designing the unique King George marimba, which was built by the J. C. Deagan company expressly for the IMSO. Only 102 King George marimbas were built: 100 for each member of the orchestra, one for Musser himself, and one as a spare. The marimbas were also personalized for the performers. Each was adjusted to the height of the individual player and each featured the name of the member engraved on the gold British coat-of-arms on the front of the instrument. 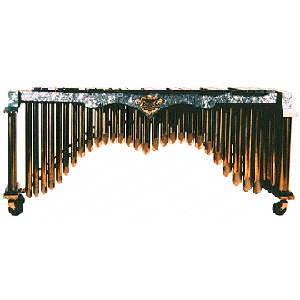 The PASThe Percussive Arts Society is a music service organization whose mission is to inspire, educa... More marimba is number 97 of the 102 instruments made. The range is four octaves from F (below middle C) to f4. 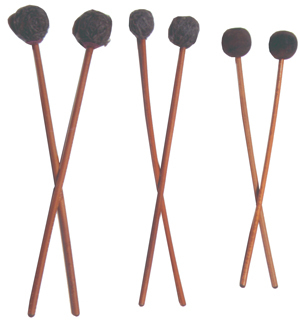 It has brass end posts, and the brass resonatorsThe metal pipes that extend below the bars on a marimba, xylophone, or vibraphone. They carry t... have three height adjustments for adapting the instrument to different temperatures.